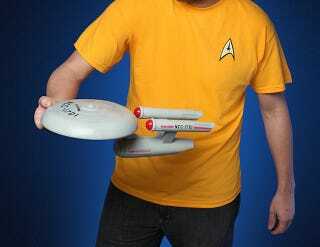 In the grand tradition of April Fool's products turning into reality, the ThinkGeek NCC-1701 Enterprise (the original, of course) has now become reality. The saucer section spins when you throw it, and it tows the rest of the ship with it. It's very cute and fun, but if you got hit in the face with this, it's not a meet cute. It's a hospital visit. You can pick one up at ThinkGeek for $24.99.